On Thanksgiving I am thankful for independent, volunteer-powered community radio. More than ever we need citizen journalists and independent media outlets to report on the stories that do not simply contribute to the profits of networks and their advertisers. I am thankful for KBOO, 90.7 in Portland for airing my show, Beloved Community, every second Friday from 9-10 a.m. This show is politically oriented and provides resources for activists. 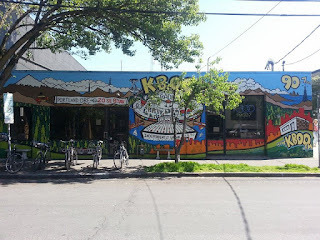 I also host a weekly radio show/podcast that airs on several stations and is produced at KBOO. Progressive Spirit talks about values, spirituality, social justice, and religion in society. My programs got a boost this week. The Pacifica Radio Network has featured my interview with Matthew Fox on Sprouts! As many as 40 stations or more will air it this week. As a special shout out to them, I am linking to their websites on this post. You can hear that Sprouts broadcast here. You can hear the full 60 minute interview with Fox that aired on KBOO here. Please support your neighborhood community, college, or public radio station. Now is the time for citizens to stand up against neo-facism. We need all institutions in the public sphere to rise up and resist. *Also carrying my show this week on Sprouts. Gratitude for all stations who have carried my show for the first time through Sprouts this week!